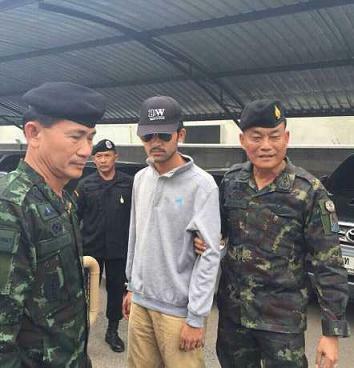 A foreigner arrested (Pictured) at the border near Cambodia is unlikely to be the man in a yellow-shirt suspected to have planted the bomb at Bangkok’s Erawan shrine on August 17, police said today. The suspect was identified as Mieraili Yusufu or Yusufu Meerailee. Today’s development implies that the bomber remains at large despite two arrests and naming of seven other suspects in recent days. The evening blast left 20 people dead and more than 120 injured. Thai authorities have suggested that at least two of the suspects are possibly Turkish. National police spokesman Prawut Thavornsiri said DNA samples taken from the suspect did not match the DNA found on evidence that the bomber is believed to have left behind in a taxi, a banknote and a motorcycle taxi he rode after leaving the pipe bomb under a bench at the shrine. “Now we don't have any evidence to say that he is the yellow-shirted man ... from the investigation maybe he is not [the yellow-shirted man],'' Prawut told reporters. “However, he is definitely involved with the bombing,'' he said. The police are certain of this because his DNA was found in the two apartments on the outskirts of Bangkok from where bomb making materials were also found, Prawut said. Another suspect who was arrested from one of the apartments on Saturday is also no the bomber. Police have also identified seven other suspects for whom arrests warrants have been issued. Also today, Thai authorities unveiled the centerpiece of the Shrine, which was slightly damaged in the blast. “The most important issue for the country's image is to restore confidence about safety,'' Minister of Culture Vira Rojpojchanarat told reporters today.